Evocative and brimming with history, Monteveglio is a medieval village sitting – literally – on top of a hill, overlooking the valley of Samoggia, the Bolognese Apennines and the Po Valley, an easy 35-minute drive from Bologna. It makes for a perfect afternoon trip followed by dinner at the local trattoria (romantic idea, too!). Monteveglio and the surrounding territory had a prominent role in the 11th century, at the height of the sometimes bloody disputes between the Church and the Empire over control of the territory, when a charismatic woman, Matilde di Canossa, reigned over these lands and fought on the side of Pope Gregory VII against Emperor Henry IV – winning. The entrance to the village is marked by an arched gateway and a tower, the remains of the old castle dating back to the 11th century; they are surmounted by a walkway featuring a nice view of the surrounding hills. Inside the tower is the visitor center with information on the history of the area and the surrounding regional park (open on Sundays and holidays, from April to November, 3 pm to 7 pm). A cobblestone street lined by old stone houses cuts across the village, ending at the Abbazia, the beautiful abbey rebuilt on 5th-century Roman ruins in 1092 by Matilde di Canossa. The church, small and simple yet evocative, features an apse, a crypt and a presbyterium, located 3 meters above the church level with an altar and a sculpture of Christ crucified. Adjacent to the church is the 15th-century cloister; the rest of a second one looks out over the valley. 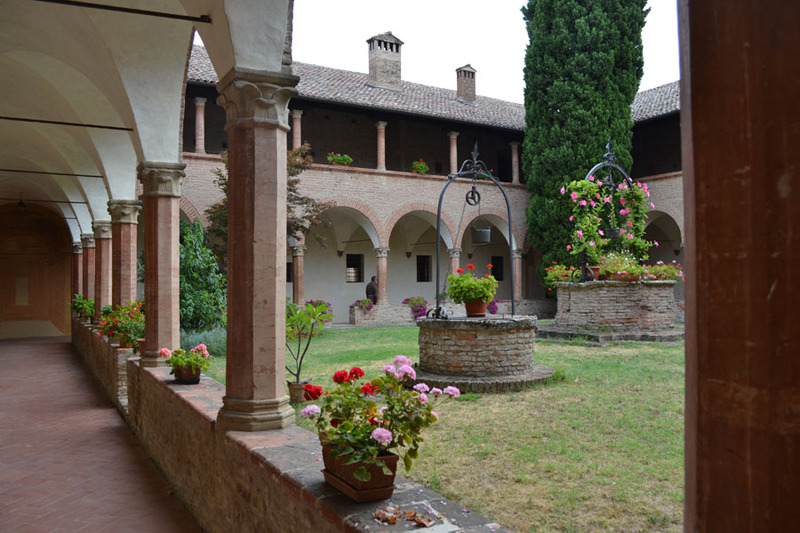 (Reservations are necessary to visit the cloister; contact the community of Fratelli di San Francesco – St. Francis’ Brothers – the religious order now living there). Trattoria del Borgo, on the main street in Monteveglio. Excellent local cuisine with a twist and regional wines, like the splendid Pignoletto. The outside terrace is especially nice – and oh-so-romantic – on a warm, breezy summer night. 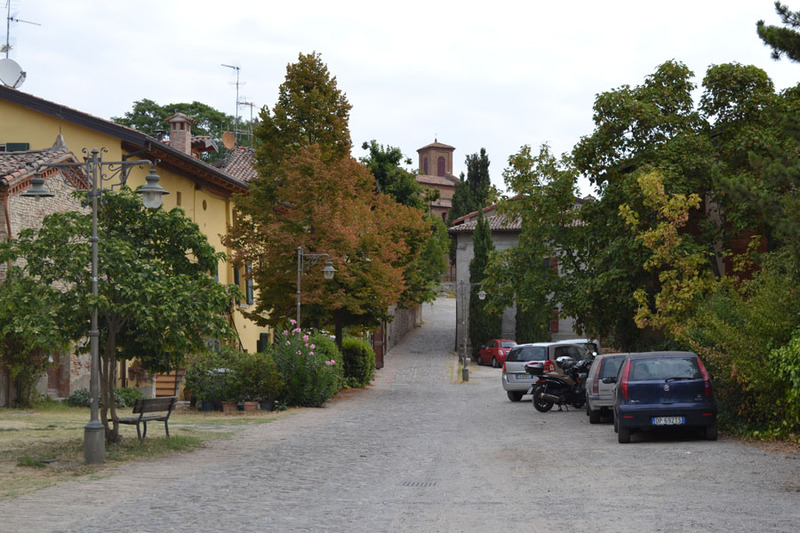 Festa d’Autunno (Fall Festival): traditional caldarroste (roasted chestnuts) typical of this time of the year and the good wine of the Bolognese hills are the main draw of this festival, along with folkloristic music and representations of the old farmers’ trades. Held the second weekend in October. Monteveglio is part of the Parco Regionale dell’Abbazia di Monteveglio, where you can hike, bike, discover the local wildlife and the old, quiet villages that dot the area, such as Montebudello and Oliveto. 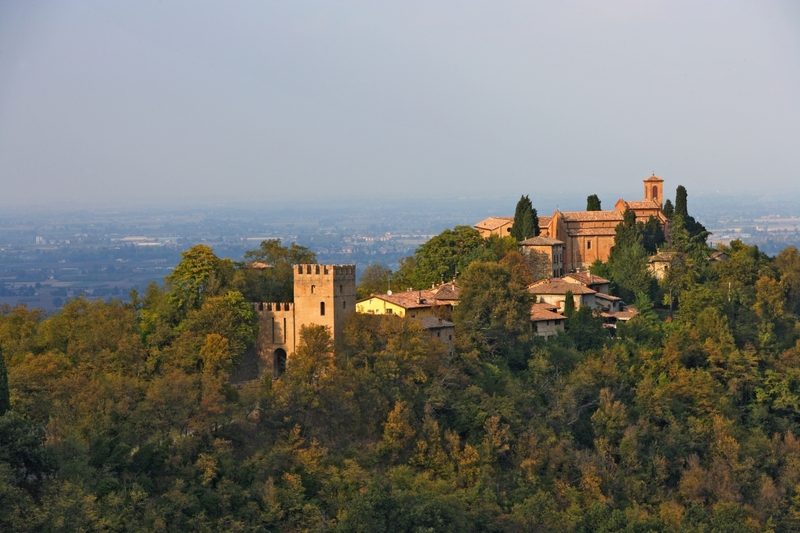 From Bologna’s tangenziale, take the state road 569 “Bazzanese” and follow signs for Crespellano/Bazzano/Vignola; when you reach Muffa, turn left for Monteveglio and follow signs for Parco Regionale Abbazia. 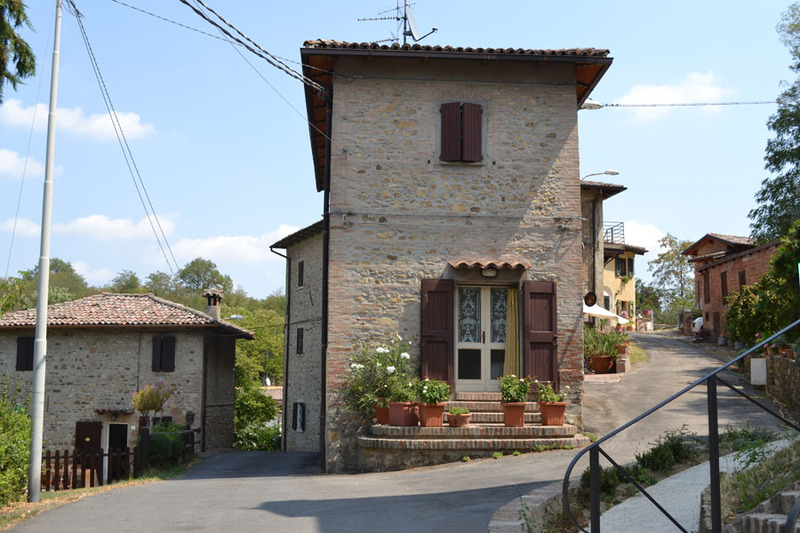 There are two parts to Monteveglio: the modern part is at the bottom of the hill; to get to the old part, follow signs for Abbazia, driving up the hill until you reach the entrance of the village, clearly marked by the tower. Monteveglio as you described sounds good. I think it worths while a visit. In the next future I will visit this nice place since I am interested to old history. Thanks a lot. 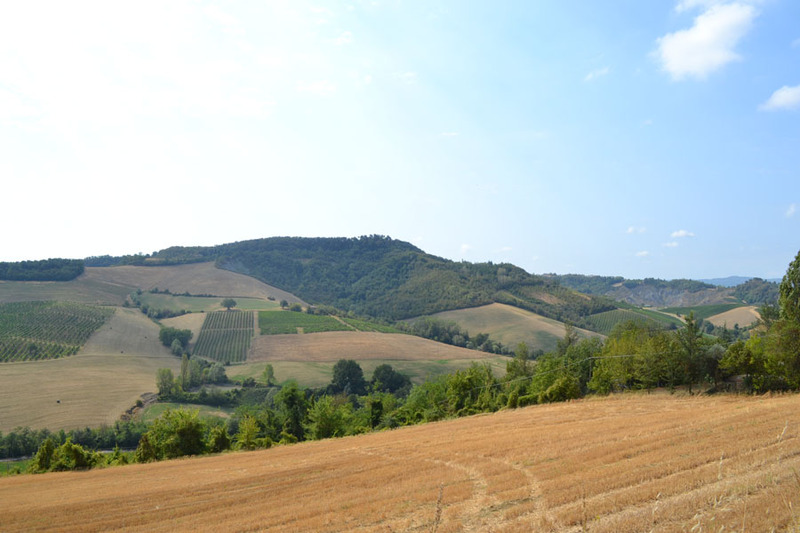 Monteveglio is definitely worth a visit, especially if you like history! The religious order that manages the Abbazia and lives in the adjacent monastery (Fratelli di San Francesco) has produced a very informative book on the history of Monteveglio and the surrounding area. It also has beautiful photographs by the way. Ask for a copy when you visit the Abbazia! What a pleasure to hear that you found my description to be faithful to the place and its atmosphere – I liked the word you used, peaceful – that’s exactly how Monteveglio feels to me. And romantic, yes! I think you are making a very beautifull work. I would like to be in every side you describe . Thank you so much for your words! I’m happy I’m inspiring you to see and experience the places I describe! Ciao, Silvia! This is a lovely and very accurate depiction of the Abbazia (couldn’t agree more about the romantic dinner on the terrace). Peaceful is such a wonderful description. I am marrying a Bologna native (though we live in the U.S.) at the abbey in May, also where he proposed last Spring…it’s like a dream! We will be including your link on our wedding website for our guests to explore. Thanks so much for all of the information! Ciao Kate! First of all, congratulations! What a wonderful place to get married! I am so glad you liked my description of Monteveglio. 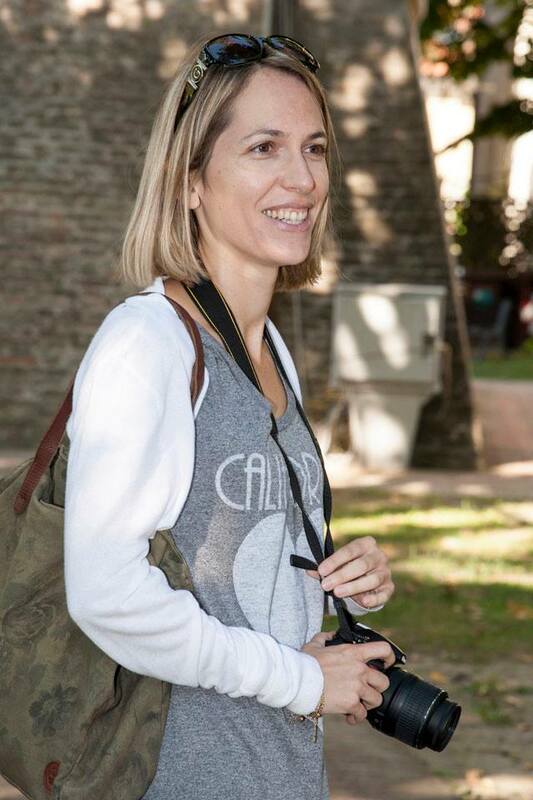 Thanks so much for including the link on your wedding website (and I would love to have the link to your website too – if you’d like you can send it to bolognauncovered@gmail.com). I am currently living in the US too, working as a journalist, I moved back here two months ago – so I had to put my project for this website temporarily on hold. Say hi to your fiancé from a fellow Bolognese! !